At the turn of the twentieth century most of the endemic bacterial diseases were not encountered any longer in well developed countries. Whenever a few cases occured the disease could now be quickly checked, at first with vaccinations, and later with the use of antibiotics. On the other hand in tropical countries large number of cases still occurred well after the end of the Second World War. The Colonial Medical Corps fought against some of them as its physicians took a part in the improvement of already existing treatments or in the working out of methods of prevention They happened also sometimes to discover the pathogen which was involved and the agent of transmission as for instance for Plague. 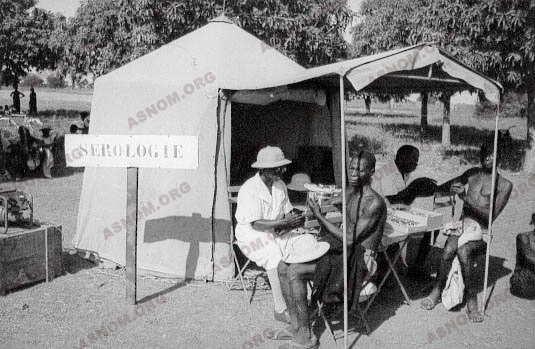 Colonial physicians carried out mass vaccination programs for the immunization of whole populations and this achieved the control of some diseases such as diphteria, tetanus or typhoid fever. Some other diseases were vigorously fought against as soon as effective medications became available such as for leprosy, non venereal syphilis and cholera. These conditions are presently subsiding. In spite of all efforts some conditions remain today unchallenged but advances of medicine will make that some day they will be successfully fought against such as tuberculosis or meningococcal meningitis which today can hardly be prevented with vaccines, these being either unsufficiently efficient or too expensive to be widely used.